PENN YAN—It’s easy to forget you are in Penn Yan Academy when you walk through the Court Street school. Renovations and additions have transformed the 1965 building and work is ongoing for the major capital project that was planned to bring the structure into the 21st century. Moving to the south end of the building by way of a landscaped courtyard, the tour entered the Media Center. This area is light years away from the small area that formerly housed this vital part of the school. One area has been designed so that it can be isolated from the rest of the area for use outside of school hours. A sliding wall and outside entrance will allow use by the public. The Media Center is on two levels and includes traditional library features, such as walls of bookshelves, computers, work tables and an informal area complete with upholstered chairs. Outside, the sloped entry walk features radiant heated surfaces which will allow for greatly increased safety. Pullen said another practical reason for the radiant heat is that there would be nowhere to put snow in winter. 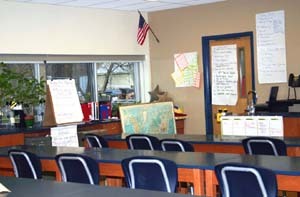 A science room was one of the classrooms on the tour. Now four teachers are sharing the room that features cupboards covering two walls allowing ample, secure storage. Other than the fact that classrooms have four walls, there are marked differences from early rooms. The floors are carpeted and many classrooms have wedge-shaped desks that can be arranged in rows, clusters or groups depending on the project at hand, a feature that has become essential. Smart boards, the touch sensitive multi media systems that enhance a variety of teaching situations, are in every classroom. As one section is completed, work on the next begins. Music program students are using former art rooms until the new music suite is completed. Many faculty members are cheerfully enduring either sharing classrooms or are working in tight quarters. Psychologist Ray Barone is in one of the smallest rooms in the school that was the athletic director’s office years ago. Work began on the $29 million project to renovate and add to the high school in June 2008. Work on the auditorium and high school roof are part of a $5.3 million capital project approved by district voters in 2008. Plans for a special celebration to mark the opening of the new gym are being made and will be announced shortly. The entire project is expected to be completed by the time school begins in September 2010.